One of the big topics the online marketing industry is dealing with is the ongoing standardization of native advertising formats and programmatic advertising. Buying processes and cross channel control of campaigns have to become easier. Viewability as the crucial KPI is becoming more and more important on the advertiser site. In the programmatic field it is already recognized and will get big for native advertising in short term. Advertisers become more demanding and ask for higher transparency. They want to make sure if and to who their ads are delivered. 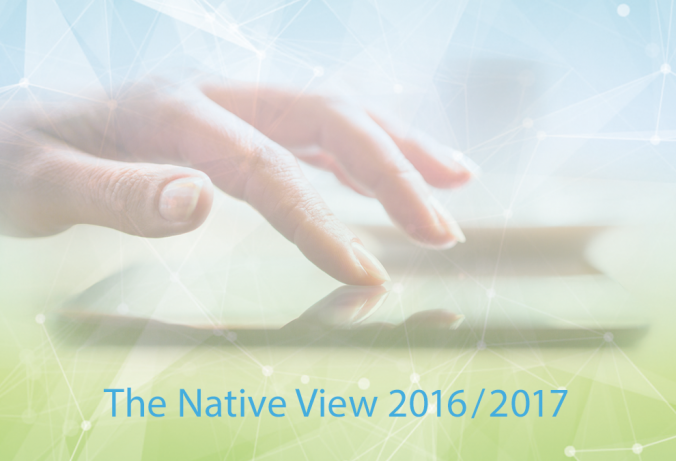 Furthermore, the native formats will be involved completely into the programmatic marketing environment. Therefore standards of native formats will be needed in the future. In times of growing banner blindness, advertisers are recognizing video advertising as a new popular format. Videos generate higher user engagement rates and create more awareness than display banner. Due to limited inventory for InStream advertising, Outstream-Video ads enjoy a rising popularity these days. The placement within text paragraphs ensures users’ attention. In addition, the targeting and adaption of the surroundings offer a higher relevance to users. Especially on mobile, video formats reach outstanding results. Studies expect tripled video traffic through mobile phones from 2015 to 2017. And as seen atdmexco, virtual reality is becoming a platform for advertisers. This leads to new opportunities and challenges. In this context advertisers need to overthink their content strategy. It is not only written content but images and videos that will attract users’ attention in the future. To reach users with the content, native advertising needs to offer solutions for every screen size. Currently users consume content across mobile, tablets, and desktops. But the trend is developing towards first screen usage although markets differ tremendously in their user behavior. For example, the youth of Asian countries like China and Japan even leap the desktop era completely, which leads to immense increase of mobile usage. However, the individual device usage within generations varies a lot. KPIs need to be defined that represent this development and data silos have to be cut back. A consolidated exchange of data needs to be established. Even if this is a global topic, the usage of devices differentiates by region and age. Global product teams and local developer have to cooperate, to comprehend developments and to identify bigger potential. During the last months chatbots stepped up on the stage of the advertising world. As Millenials are proving an increasing use of messengers like Snapchat, content can be published native but needs to come across more emotional. Now it is up to the communication and social media representatives to accept the challenge and break new ground like they did before with Facebook. The technologies are new and develop even faster. Provider will need to adjust their strategies and deal with these challenges in 2017.